Our Men's Cubic Zirconia Cufflinks are tasteful and contemporary and add that special finishing touch to every gentleman's wardrobe. 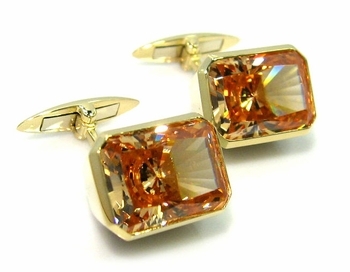 Cufflinks from Ziamond feature the highest quality of hand cut and hand polished Russian Formula Cubic Zirconia in diamond look, canary yellow, cognac and pink diamond look in addition to colored gemstones that include man made red rubies, green emeralds, and blue sapphires. All Ziamond cufflinks are set in 14k white gold, 14k yellow gold, 14k rose gold, 18k white gold, 18k yellow gold and luxurious Platinum. The excellent craftsmanship and classic styles ensure them to be a long time favorite for years to come. Ziamond cufflinks are an attractive addition to every fine jewelry collection. We also offer custom made design services and have the ability to customize all the cufflink styles offered. For further assistance, please call us directly at 1-866-942-6663 or visit us via live chat and speak with a live representative.